"Made out of Solid Knotty Pine, this is a beautifully handcrafted wood sign for home interior wall decor. Made in the USA. The attention to detail will leave you overwhelmed. Its hard to find handcrafted home decorations that are made by a local artist in the USA. 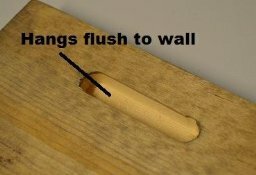 Routed slot in back for hanging plus flat edges for optional shelf-sitting." 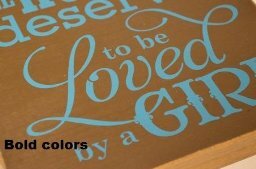 I was sent the 'All Horses Deserve To Be Loved By a Girl' Wood Sign from Custom Global Products to review. This sign costs $17.99. Shipping is free with Amazon Prime. 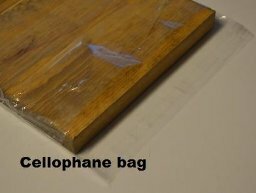 This sign arrived in a cellophane bag that was sealed all around. It was clear so you can see through to the actual sign. Wood signs are a very fun way to decorate your house-- especially when they are designed with quotes and things that pertain to your life in specific. 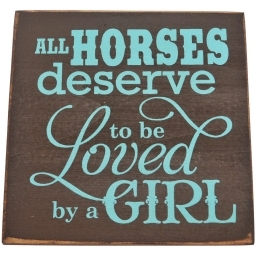 I got this sign for one of my best friends as she has two horses that she adores. I know that she will love this! The coloring is very nice-- you can select between two themes. Each sign has distressed edges. The sign is actually pretty thick, so you can hang it or set it. It's made from real wood. The back has a hole that is cut so this sign sits flush against the wall. Nice size for room or office. I have not found any cons of this sign. When I saw this sign, all I thought about was my friend, Emily. She loves horses, and teal is her favorite color. I wanted to get this just for her, so she could put it in her office and think about her horses while she’s working long days. 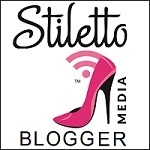 The sign is small, but it’s great for an office or alongside other western décor. The wood is thick, and it’s uniform throughout. The paint is bold and thorough. 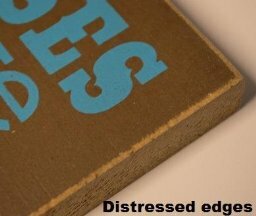 The edges are distressed to amplify the western look. This arrived in a sealed bag, so it’s decently protected from scratches. Lastly, there is a hole in the back that allows this to sit flush against the wall. 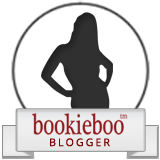 I definitely recommend checking this out. 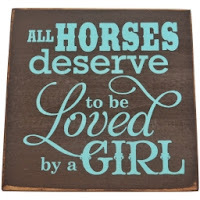 Are you wanting to try the 'All Horses Deserve To Be Loved By a Girl' Wood Sign, too? Click the link below, and order away! All your text deserves praise. Good job!